There are numerous health benefits associated with the use of fresh herbs – For example, basil acts as an anti-inflammatory and mint can alleviate nausea – all while adding impeccable flavor to any dish. Unfortunately, due to the climate we live in, you don’t always have access to fresh herbs throughout the year. But why let that stop you? Hydroponics is a process in which plants are grown indoors in water. Many larger greenhouses employ this method in their large-scale operations, but it can also be used on a smaller scale at home! Many herbs flourish being grown indoors using this technique – providing you with fresh herbs year round that are rich in flavor, color and nutrients! 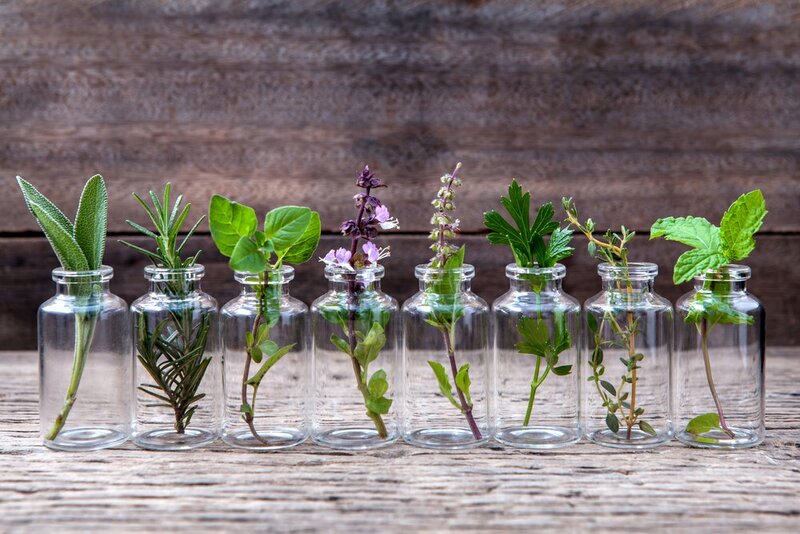 Take an herb cutting of your choice (check out the suggestions listed below) approximately 6 inches in length, and remove all leaves from the bottom 4 inches. Lower leaves can rot when left in water for an extended length of time. Alternatively, you can use grocery store herbs by cutting off the bottom of the stem allowing it to properly absorb water. Fill a glass or large-mouthed jar with fresh water, either rain water or tap water. Avoid using distilled water as it doesn’t contain all the essential minerals needed for your herbs to grow. Make sure you are using a large enough container; tight fitting containers won’t provide the space needed. Change the water once a week until the roots of the herbs start to grow. After the roots have sprouted, do not continue to change it. Place the jar or glass in an area where they will get a lot of sunlight such as on a window ledge. Your herbs will need to get at least six hours of sunlight each day. As your herbs grow, and your leaves reach full size simply clip the leaf for use, but leave the herbs in the water. Clipping the leaves will encourage the stem to produce more leaves at the top. A single stem can continue to grow and produce you with a steady supply of fresh herbs for months! What herbs are the easiest to grow indoors? Just as with any other gardening technique, there will be some plants that will take to it better than others. Here are 10 different herbs that are idea for your hydroponic herb garden. Next time that you are cooking up your favorite meal, enjoy it with fresh herbs from your own indoor herb garden! Previous ArticleHow Essential Oils Affect Your Vision – Watch Your Vision Recover to 97% With This Essential Oil!